Churches in Egypt have called on members, including Christian Copts, to suspend all activities outside churches over security threats revealed by intelligence agencies. Religious sources have indicated that conferences and religious camps will be suspended for three weeks following threats detected by authorities. “We are talking about conferences and travel for religious events, for three weeks, because we have information in cooperation with the responsible agencies that attack attempts have been detected,” Reverend Andrea Zaki, head of the Egyptian Evangelical Church told AFP. Father Rafik Greish, a spokesman for the Coptic Catholic Church, said Copts complied with the interior minister’s decision to cancel church trips and camps until further notice, Reuters notes. Masses will continue at churches where security presence has been beefed up. The decision to suspend activities outside churches comes in the backdrop of mounting threat against minority Christians following the attack against a group of Copts traveling to a monastery, in May. Masked men killed 29 voyagers while wounding over 40 other people. 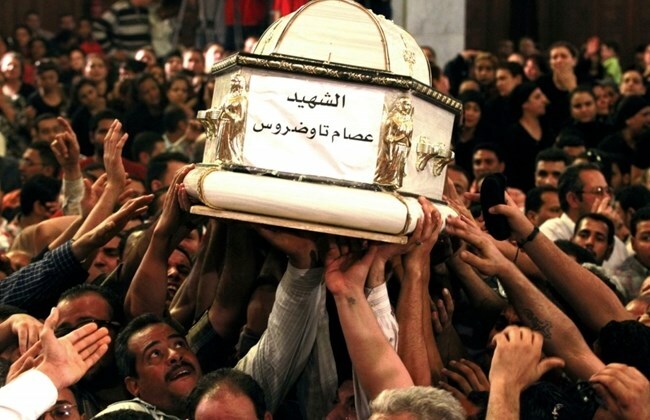 The Coptic Christians were also victim of coordinate terrorist attacks early April after two attacks claimed by the Islamic State group (IS) targeted two churches in Alexandria and Tanta. Another IS-masterminded suicide bombing hit a Coptic church in Cairo in December. Written by: Jaber Ali on July 14, 2017. Posted by Jaber Ali on Jul 14 2017. Filed under Headlines, World News. You can follow any responses to this entry through the RSS 2.0. Both comments and pings are currently closed.